Complex crystal (octahedron modified by rhombododecahedron and trigontrioctahedron) of black Spinel (var. Pleonaste) with miror faces within magnesial skarn matrix, composed by greenish Diopside, orange-pink Calcite and minor brown Phlogopite (mainly at the back side). For size look at ruler. Pavel M. Kartashov collection, Sibmin photo. 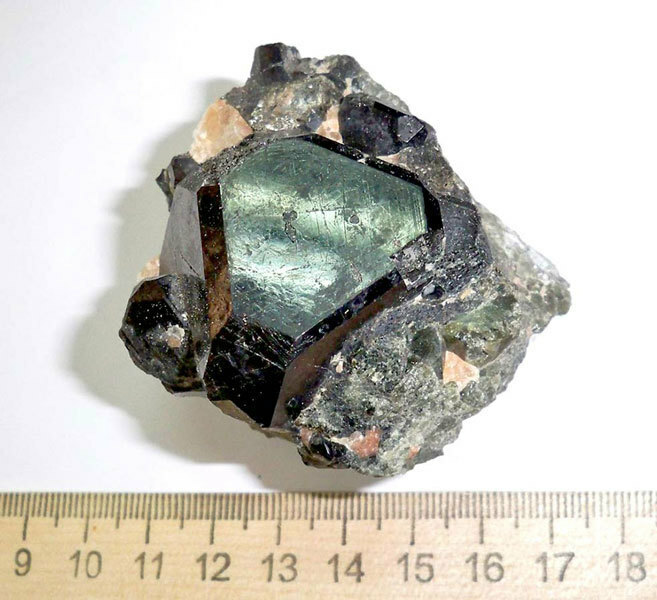 Octahedrons up to 2 cm in edge of very dark olive-green Gahnite (var. Dysluite) within white Calcite (fluorescenting red). Pavel M. Kartashov collection and scan. 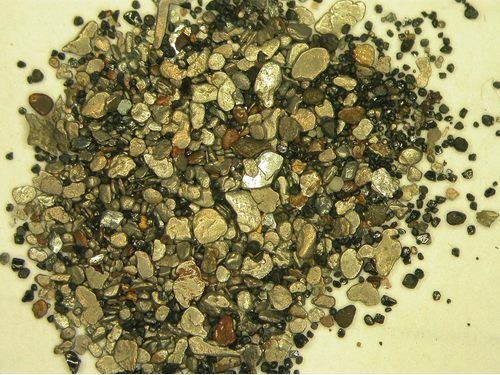 Portion of heavy concentrate mainly composed by wrought and waterworn, flattened grains of far transportation of Ferroplatinum of different composition, black crystals of Magnesiochromite and yellow grains of native Gold less far transported by water stream than platinum. 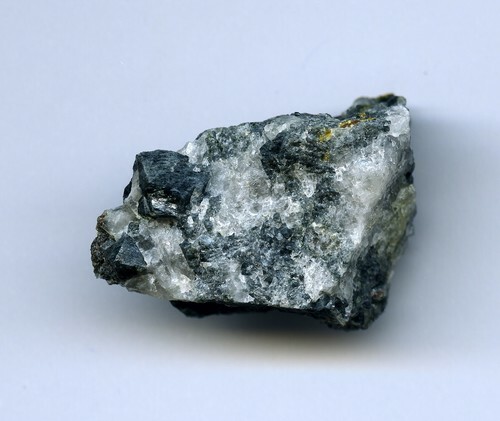 Ferroplatinum is represented here by two inrecognizable by naked eye minerals - Polyxene and Isoferroplatinum. Polyxene has composition Pt 92.05/92.75, Pd 0.75/0.50, Fe 5.83/6.02, Cu 1.29/0.50 mas.%, what may to be expressed by formulae (Pt0.78Fe0.17Cu0.03Pd0.01) / (Pt0.80Fe0.18Cu0.01Pd0.01). This is low ferroan Polyxene, what is unusual. May be it is of secondary origin and was formed during oxidation of iron from Isoferroplatinum. Isoferroplatinum has composition Pt 87.53/88.84, Ir 1.99/0.64, Rh 0.48/0.00, Pd 0.35/0.20, Fe 9.03/9.75, Cu 0.63/0.57 mas.%, what may to be expressed by formulae (Pt2.81Ir0.07Cu0.06Rh0.03Pd0.02)2.99Fe1.01 / (Pt2.84Cu0.04Ir0.04)2.92Fe1.08. Due to different iron contents in these two minerals, they able to be separated by magnites. The brightmost rare tin-white grains are native Iridium with composition (Ir0.86Os0.10Ru0.03Pt0.01). 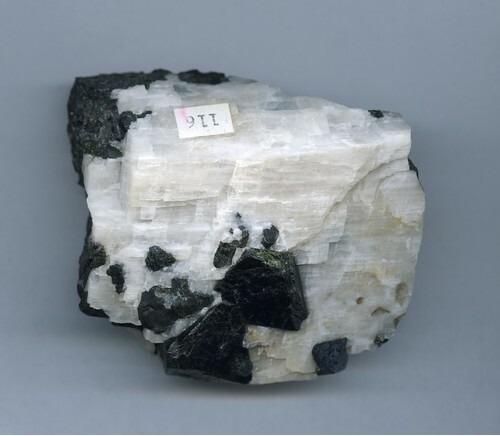 Invisible at the photo minerals of the concentrate are represented by black Laurite and Erlichmanite crystals, Pyrite, Zircon, Magnetite crusts over Magnesiochromite crystals. Pavel M. Kartashov analytical data, collection and photo. 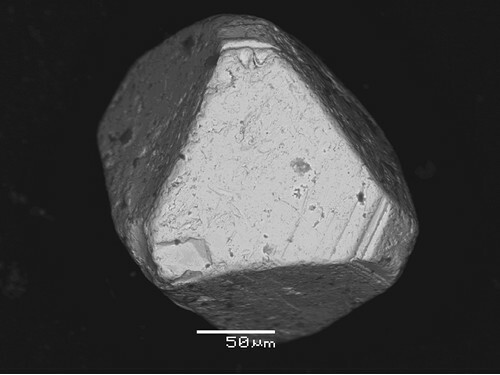 SEM image of well formed, but small, octahedral (modified by cube) crystal of Isoferroplatinum from weak magnetic fraction of heawy concentrate. The crystal has composition Pt 88.84, Ir 0.64, Pd 0.20, Fe 9.75, Cu 0.57 mas.%, what may to be expressed by formulae (Pt0.71Fe0.27Cu0.01Ir0.01) or (Pt2.84Cu0.04Ir0.04)2.92Fe1.08. 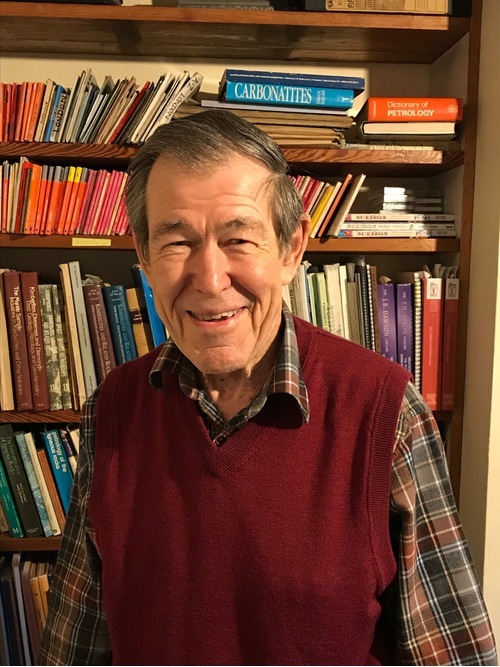 Peter H. Nixon (b. 1935), Professor of Mantle Geology at Leeds University, UK. 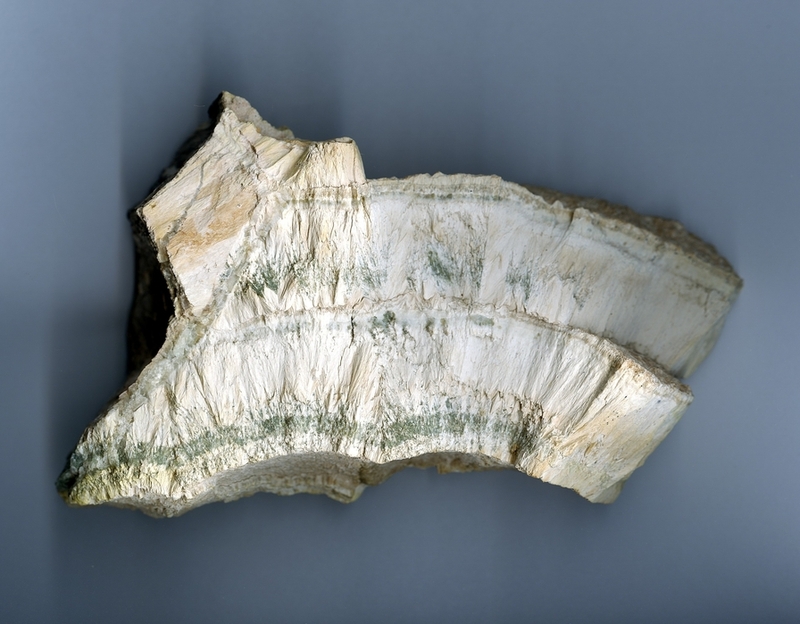 The rock mainly composed by layers of compact fibrous creamy Dalnegorskite with minor layers of dark-green prismatic Hedenbergite. Selfcollected at the lower horizonts of the quarry in August of 1990. Dalnegorskite forms here as intermediate product at the front of metasomatic replacement of earlier Wollastonite by late formed Bustamite (which both able presented in the sample as minor components of Dalnegorskite layers). 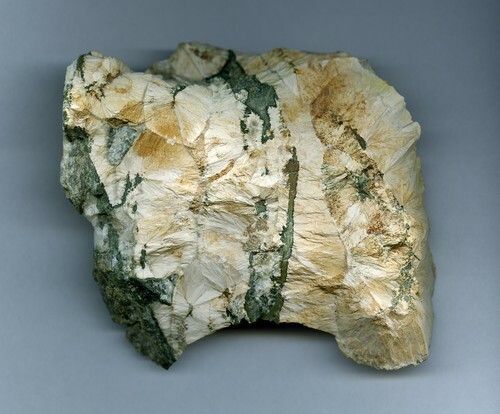 The rock mainly composed by layers of compact fibrous creamy Dalnegorskite with minor inclusions of green Hedenbergite and light-green to greyish-green Datolite. Selfcollected at the lower horizonts of the quarry in August of 1990. Octahedral crystals of Gahnite in Quartz rock with minor yellow Sphalerite (var. Cleiophane). Collected by Joan Abella Creus 8 August 2000. Half of amygdala from basalt filled by crystals of Heulandite-Ca. 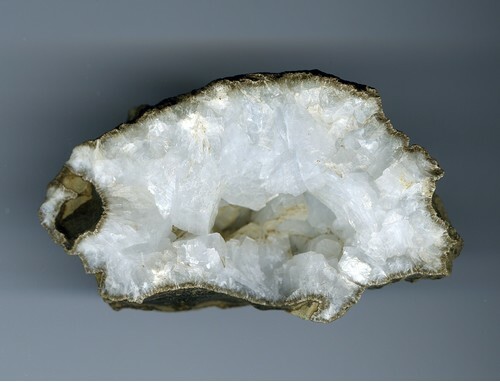 Its outer layer composed by tobacco-coloured layer of Celadonite filled by perly fibres of Mordenite. 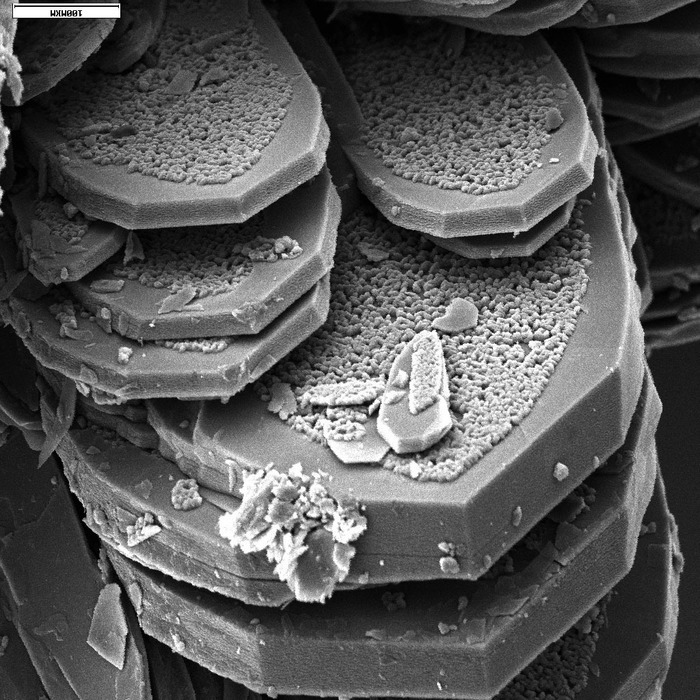 SEM image in reflected electrons. Tabular crystals of Kyrgyzstanite covered by minor globular Allophane aggregates. Vladimir Karpenko photo of the holotype material.